ASUS has released two ROG Ryujin closed-loop liquid coolers designed for AMD’s Ryzen and Ryzen Threadripper processors. Both AIO LCSes feature a square waterblock with an embedded OLED screen that can be used for monitoring or style/personalization purposes. In addition, the waterblock has a small fan to cool down the CPU VRMs. ASUS’ ROG Ryujin 240 and ROG Ryujin 360 closed-loop liquid coolers rely on an ASUS-designed proprietary waterblock, and which is compatible only with AMD’s CPUs in AM4 and TR4 packaging (for now, AMD only supplies mounting brackets for contemporary AMD CPUs). 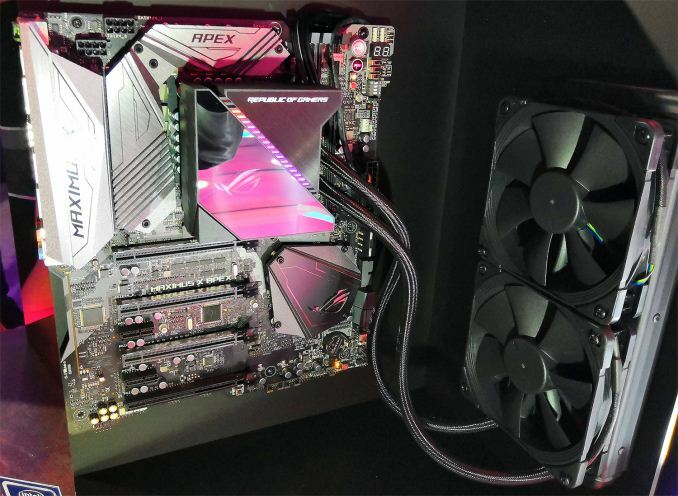 ASUS does not describe design of its pump/waterblock beyond the fact that it is large, square, features an embedded 1.77-inch OLED display, as well as a microfan that can cool down surrounding components by up to 20°C, according to the maker. Meanwhile, the relatively large dimensions may indicate that the block can cover 100% of the TR4 CPU IHS (integrated heat spreader), which means efficient cooling for AMD’s latest multi-core Threadripper 2 processors for "extreme" workstations. The manufacturer does not specify the maximum amount of thermal energy its ROG Ryujin LCSes can dissipate, but good large closed-loop liquid coolers can remove upwards of 500 W of heat. As the names of the ROG Ryujin 240 and ROG Ryujin 360 LCSes imply, they are equipped with radiators carrying two or three 120-mm fans. For its top-of-the-range coolers ASUS uses premium Noctua IndustrialPPC-2000 PWM fans, which are rated for 2000 RPM with noise levels up to 29.7 dBA, to ensure their reliable and quiet operation over prolonged periods of time. Speaking of reliability, it is also worth mentioning that the LCSes are equipped with reinforced sleeve tubing that promises to be very durable. Like most ASUS ROG components introduced in the last couple of years, the ROG Ryujin AIO liquid coolers are built not only to perform, but to too look strikingly distinctive. Besides the aforementioned 1.77-inch OLED screen, the waterblock features Aura Sync RGB LEDs. It is noteworthy that the display, the RGB LEDs, and the fans can be controlled using the ASUS Vortex software, which greatly simplifies the process. 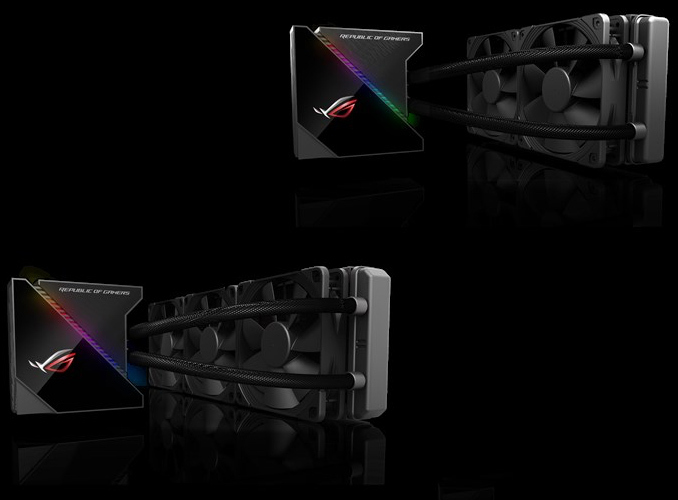 ASUS currently lists its ROG Ryujin 240 and ROG Ryujin 360 closed-loop liquid coolers on its global website, so expect the products to become available shortly. MSRPs of the products are unknown at this point.